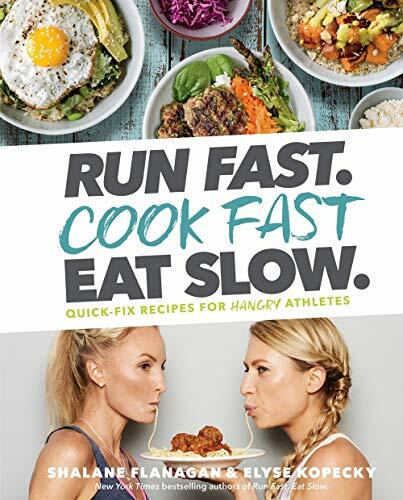 This week on the blog we're talking about Shalane Flanagan's new cookbook, "Run Fast. Cook Fast. Eat Slow." To kick off the week on Monday I shared the benefits to health and weight management of eating slowly. It sounds easy, but most people overlook the simple strategies and instead are in search of the magic pill. What if your healthy lifestyle began (or thrived) with something as simple as slowing down when you eat? Today for 'Workout Wednesday' we're going to discuss some strategies for running faster, and Friday we'll round out the week with the "superhero muffins" recipe that I made from the cookbook. Thanks for hanging me with this week, I can't wait to share! I love Shalane Flanagan because she gives me hope that I have room to grow and improve as a runner that is over 40. She's almost 40, and she won the New York City marathon last year. I never was, and never will be, an elite athlete, but it gives me great inspiration to see women in their late 30s and 40s crushing it. how to run fast. save to your favorite Pinterest running board for later. No matter your current fitness level, most runners want to run faster, whatever that means to you. Whether your goal is to go from a 12-minute mile to a 10-minute mile, to an eight-minute mile or a seven-minute mile or faster, there are strategies that can help every runner improve their pace. When I think about improving a running pace for myself or my clients, I think in terms of improving the easy running pace. The goal should be that your fitness level improves so that you can run faster at a 'conversational pace' that feels easy. The conversational pace is the speed that you can run and still hold a full conversation with your running partner without taking large gasps of breaths between words or sentences. It's your easy pace. When you improve your fitness, your body will move faster with less effort. It may seem odd to start with recovery rather than sharing interval or hill workouts to improve speed, but recovery is so important, and a lot of runners sabotage their potential for improvement by running too fast, too often, and not allowing enough time for recovery. Our bodies adapt to training, get stronger and faster, during the rest after the workout, not during the workout itself. That means if you don't allow enough time for proper recovery you may stunt progress and risk injury. There are a few ways to optimize your recovery to make sure you are getting the most out of your workouts. 1. Take at least one or two full rest days each week. Low-intensity activities like walking, mobility exercises, or foam rolling are appropriate, but no hard-effort, heart-pumping exercises should be performed on rest days. Learn to listen to your body and honor the feedback that it provides. If you have a lot of stress in your personal life, at work, or if you lack sleep, you may need additional rest days. As we age, we probably need more rest days than we did when we were younger (dammit). 2. 80% of your weekly runs should be performed at an easy or recovery pace, 60-90 seconds slower than your 5K pace or 70% (or less) of your max heart rate. It's harder than it sounds. Our impulse (or our ego) tells us we should be running faster, but working too hard every day will sabotage our recovery, and therefore our progress. We'll do speed work as part of training, but you shouldn't be running at a hard effort, or even a moderate effort every day. One of the most common mistakes I see from recreational runners is that they hit the streets every day at the same heavy-breathing pace. If you're out of breath, covered in sweat, sore and achy after your easy run, it wasn't an easy run. Running easy should feel comfortable and relaxed. 3. Most people need at least seven hours of sleep per night if you're an endurance athlete you need more than your couch potato co-worker. Most of our body's recoveries processes happen during sleep. If you're working out you will benefit from eight to nine hours per night for best results. So let's recap: To run faster you must rest more, run slower and sleep longer. I know it sounds counterintuitive, but the reason runners don't see improvements is largely due to ignoring (or not knowing) this advice. It's not easy, but it's a necessary part of the training plan. Now that we've covered the recovery basics, we can talk about the fun training, the speed work. Did I use speed work and fun in the same sentence? Speed work stresses the body to produce the physical changes necessary to run faster. With proper recovery, it increases your aerobic capacity to make your heart stronger, so it can deliver more oxygen to the muscles and use oxygen more efficiently, which makes running at faster paces feel easier. Our body adapts to the stresses we place upon it. Once we adapt to our training, it feels more comfortable, but when it feels easier, it is less effective to produce change. To keep improving, we have to challenge our body in new ways. We can run faster, run farther, or run with more resistance, like on hills or stairs. In other words, you have to keep making it feel hard. One you've been running consistently for approximately six to eight weeks, you will likely be ready to introduce speed work. There's no reason for new runners to do speed work before they have established a running base. Once you can run comfortably without gasping for air in your daily runs, you're ready for speedwork. I like Fartleks to play with pace for new and experienced runners alike, tempo runs to train to run faster by pushing your aerobic threshold, and intervals for speed training. Keep in mind most runners at all levels will benefit from just one or two hard effort sessions each week. An experienced runner with an optimized recovery protocol may be able to handle three. My favorite interval workout can be done on a track, on the streets with a GPS to measure distance or on a treadmill. I don't assign specific paces when I share workouts on the internet because running ability varies vastly from runner to runner. Your hard-effort is the pace that causes you to be out of breath. You may be able to get a word out (and it may be a swear word), but you certainly can't speak in full sentences at this effort. While I encouraged you to take it easy on your easy days, I also encourage you to work hard on your hard days. Generally, we should stay out of the moderate pace zone. Your runs should mostly be very easy or very hard. Runners who strength train are stronger, faster, and have less risk of injury. Don't worry, you don't need to hang up your running shoes to become a gym rat, but focused runner-specific strength training can be the difference between a new PR (personal record) and an injury. Runners need to train differently than a bodybuilder or a powerlifter, so you don't have to worry about putting on bulky muscle unless that is your goal. The bottom line is that strong legs will endure the distance, a strong core will keep your form intact when you get tired, and strong arms and back power your stride. The strongest runners focus on overall athleticism. Strength training isn't an all-or-nothing choice. If you don't have an hour to spend in the gym, train for ten minutes before your next run, or carve out 20 minutes two or three times a week. It doesn't take a lot of extra time to see improvements. Read this article I wrote called the Dos and Don't of Strength Training for Runners to learn more. Download the free strength training for runners guide. On Monday we covered Eat Slow, today Run Fast and Friday, Cook Fast when I'll share the delicious superhero muffins recipe from the Run Fast, Cook Fast, Eat Slow cookbook. Did you like this post? Do you know someone who might benefit? It helps me when you share with your friends and followers.